Some fonts just class up the joint. 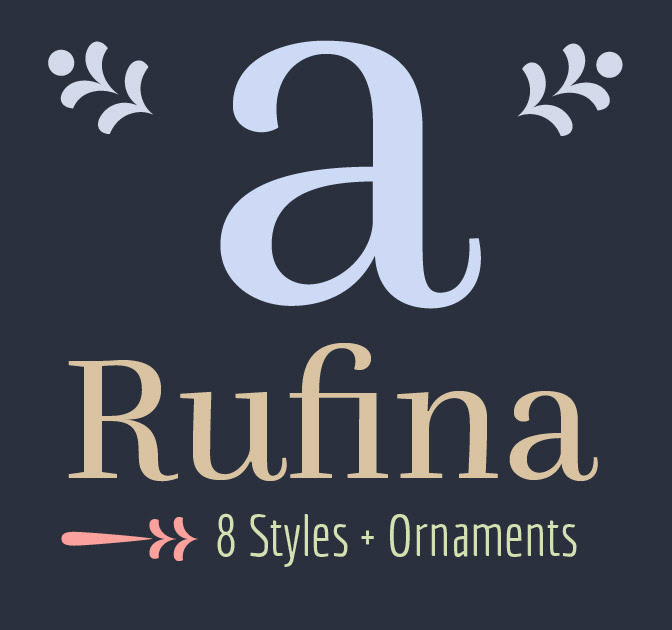 When it comes to beauty and elegance, the Rufina Font Family delivers. This simple and delicate font family owes its influence to Bodoni, mixed with the subtle elegance of a calligrapher’s pen. We’re at a pivotal time where it is important to create engaging and memorable websites for our clients, and to find platforms that will help us to achieve this along the way. One of the most important names in the industry is Webydo, which provides a web design platform that allows designers to create websites from the ground up without writing any code. The newest feature addition is Webydo’s pixel accurate, code-free Parallax Scrolling Animator that enables creative individuals to add this eye-catching and highly interactive effect to their projects. Parallax Scrolling Animations gives you the power to define the way your site’s pages move and changes as viewers scroll through it and has easily become one of the most talked about trends in web design industry at the moment. To add to the conversation is Webydo’s recent feature release of their code-free Parallax Scrolling Animator. This new feature to their platform will enable web creators to add Parallax Scrolling to their projects without having to know how to code. Webydo is offering 3,000 invites on a first come first serve basis to participate in its closed beta trial. All readers have to do is sign up and do it quickly, the offer lasts 7 days and the invites are snatched up fast. Last week, 2,000 invites were put up and they were gone in less than 1.5h. It seems like it was only yesterday that the only way of getting commercial images to use in design, advertising, or blogging was to enlist the services of a professional photographer. The problem with that picture was the huge toll it took on everyone’s budget. Stock photo agencies saved the day by introducing an affordable and expedite alternative, and today I know lots of people who created accounts with more than one stock merchant. As for me, I have a favorite: YAY Images, which I sometimes refer to as Spotify for images. Every time you enter a keyword, the results page has advanced filters that cut your search short. If you look to the right, you’ll notice a visual search option. With that, you can just drag-and-drop any image – whether it comes from your own folders, from this website, or from the wide expanse of the Internet – and the search engine shows you items from the database that resemble it. Prepare to be blown away by all new X premium WordPress theme. X is a dynamic, intuitive, and powerful WordPress theme like no other. This feature-packed premium theme boldly dares to be the most flexible and most versatile theme ever developed, and while there are a myriad of WordPress themes available in the market today packed with every type of plugin, slider, shortcode, and all the bells and whistles you can possibly imagine – the average user often gets lost in all these add-ons and still ends up with an average looking website because of the complexities in implementing all these features. The good news about X is that its intuitive and instinctive design makes it extremely user-friendly even for WordPress beginners who have little or no coding experience at all. Creating a professional looking custom website is no longer a dreadful activity especially for inexperienced users. Customizing your own website is now a pleasant and doable reality. WordPress professionals and serious coders on the other hand, will surely enjoy and appreciate the well-written code behind the seamless and efficient way this theme functions and endless ways to experiment and tweak. Today, we wanted to share with you a trend setting website creator geared towards the professional website creator, called Webydo. The majority of DIY website creators on the market are producing less than professional results, with not the best user interface, and leaving professional designers in limbo. They now must choose between finding a developer to work with and risk losing up 70% of their budget or turn to a DIY amateur website creator. However, a third route opened up to answer this need of the creative professionals, and that is Webydo.